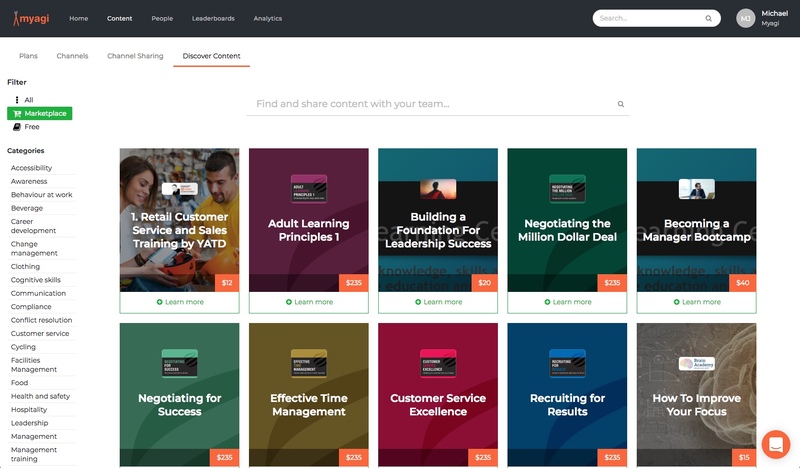 The Marketplace is a collection of the best, most up-to-date retail and skills development training from world-class experts and made available here in Myagi. As a company admin, you have the exclusive ability to try out any course for free! No taster sessions here, the whole course- so you really can try before you buy. To start a trial of the content, find the content and select Learn More. This will open a pop-up providing more details about how the course is structured and what you and your staff can expect to learn. There is often an introductory video here that will explain more about the course. The trial lasts for 2 weeks from when you click this selection. At any time you have the option to buy licences for yourself and your staff to take this content. What is a Licence? And how many do I need? Each licence grants a single user, enrollment on a course for one year. Licences sit in your account until they are used - no need to worry about them expiring before their activation. To activate a license, simply enroll a member of staff on the course. At which point the one year validity begins. To purchase licenses, go to Content > External Channels and find the Channel of the marketplace course you want to purchase. OR you can visit the Marketplace to find the course you want.